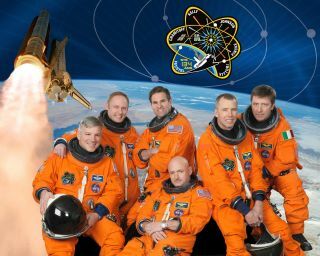 Pictured clockwise in the STS-134 crew portrait are NASA astronauts Mark Kelly (bottom center), commander; Gregory H. Johnson, pilot; Michael Fincke, Greg Chamitoff, Andrew Feustel and European Space Agency’s Roberto Vittori, all mission specialists. This story was updated on Monday, May 16, at 9 a.m. EDT. Six seasoned astronauts are flying on NASA's space shuttle Endeavour final mission and headed to the International Space Station after their smooth launch into orbit today (May 16). Endeavour and its crew soared into orbit today at 8:56 a.m. EDT (1256 GMT) from NASA's Kennedy Space Center after a two-week ago delay due to a technical glitch. It is the 25th and final mission for Endeavour before the shuttle is retired along with the rest of NASA's orbiter fleet later this year. The STS-134 crew includes commander Mark Kelly, pilot Greg H. Johnson, and mission specialists Michael Fincke, Andrew Feustel, Greg Chamitoff, and Italian astronaut Roberto Vittori. Kelly, a veteran of three previous space shuttle missions, will serve as commander on Endeavour's STS-134 mission. He said he was proud to serve on the second-to-last space shuttle mission planned before NASA retires its three-orbiter fleet. "This is the most capable spacecraft that's ever been built and probably will be built for a long period of time," Kelly said in a NASA interview. "And, I think Americans should be proud that we've been able to build such a thing and operate it successfully for such a long period of time." Kelly is married to Congresswoman Gabrielle Giffords (D-Ariz.), who is recovering from being shot outside a Tucson grocery store in January while meeting with constituents. Giffords has reportedly recovered well enough to attend her husband's launch in person on Friday from the seaside spaceport in Florida. Kelly is an identical twin. His brother, Scott Kelly, is also a NASA astronaut, and returned in March from a six-month stint aboard the International Space Station. The brothers are from West Orange, N.J.; both are captains in the U.S. Navy. Both were selected as astronaut candidates for NASA in April 1996. Mark Kelly has two children from a previous marriage. Astronaut Gregory H. Johnson, pilot of STS-123 and STS-134, poses for a preflight photo. STS-134 will be Johnson's second turn as a space shuttle pilot. Previously, he served on the March 2008 STS-132 mission of Endeavour. "My first date was with Endeavour, and my last date is going to be with Endeavour, as far as space shuttles are concerned," Johnson told SPACE.com. "Endeavour's the newest, cleanest vehicle, my favorite of the fleet, though I love them all. I'm just tickled pink that I'll be on Endeavour's last flight." Johnson was born in the United Kingdom but raised in various parts of the United States as an army brat. He graduated from high school in Fairborn, Ohio. Johnson is a retired colonel in the U.S. Air Force. He was selected as an astronaut candidate in June 1998. Johnson and his wife Cari have three children: Matthew, Joseph and Rachel. Space station commander Michael Fincke gives the Pittsburgh Steelers a thumbs up in support of their NFL playoff game. Fincke is from Emsworth, Pa. He is a colonel in the U.S. Air Force, and was chosen as an astronaut candidate in April 1996. In May 2002, Fincke served as commander of the second NASA Extreme Environment Mission Operations (NEEMO 2) mission, living and working in the Aquarius underwater laboratory near Key Largo, Fla., for seven days. While Fincke is a veteran of two long-duration missions to the International Space Station -- one in 2004 and one in 2008-2009 -- he has never ridden aboard a space shuttle. His two previous spaceflights were made on Russian Soyuz spacecraft. "It is definitely ironic," Fincke said of the fact that his first trip on a space shuttle turns out to be Endeavour's last. "It's a little bit sad, because this era's coming to an end, just when it seems the space shuttle is in its prime, it can do anything," Fincke said. "It has such a great historic amazing record. But I'm looking forward to the future." Fincke and his wife Renita have three children. Vittori was born in Viterbo, Italy. He has master's degrees in aeronautical sciences and in physics, and is a colonel in the Italian Air Force. He was chosen as a European Space Agency (ESA) astronaut through the Italian Space Agency in July 1998. Vittori has flown twice to the International Space Station on Soyuz spacecraft. Endeavour's flight will be his first trip on a space shuttle. "This is not my first spaceflight opportunity, but each spaceflight is unique," Vittori told SPACE.com. "How I will interact with the specifics of the shuttle in space -- that is unknown." ESA is one of five partners in the International Space Station; the others are the United States, Russia, Japan and Canada. As part of the agreement between the space agencies, ESA receives rides for its astronauts aboard Russian and American spacecraft in exchange for other contributions to the station, such as the European-built Columbus module that houses science experiments. "The space program started as a competition," Vittori said. "Now it's a cooperation. It's an unbelievable feeling flying in space in the International Space Station when you go from the Russian side to the NASA side. The perception is very clear. It's like flying from one world to the other." Feustel will be making his second trip to space aboard Endeavour. Previously he flew on the shuttle Atlantis' STS-125 flight in May 2009, which rendezvoused with the Hubble Space Telescope to upgrade it with new instruments, batteries and other equipment. Feustel said he was proud to participate in two science-oriented missions, since the main goal of Endeavour's STS-134 trip is to deliver the Alpha Magnetic Spectrometer, an experiment to search for fundamental subatomic particles that hopes to shed light on mysteries such as the invisible dark matter thought to make up much of our universe. "It's a very significant external science payload that hopefully will be up there for the next 10 years operating and collecting data," Feustel said. "It's important and hopefully it will lead the way for other significant science experiments like it to live on the station." Feustel has a doctorate in geophysics, and was selected as an astronaut candidate for NASA in July 2000. He and his wife Indira have two sons. NASA astronaut Greg Chamitoff, Expedition 17 flight engineer, smiles for a photo near a chess board in the Harmony node of the International Space Station, July 19, 2008. Chamitoff will be making his second space shuttle voyage. He previously launched aboard the STS-124 mission of Discovery, served about six months on the International Space Station, and then landed on the STS-126 flight of Endeavour in November 2008. During Endeavour's upcoming STS-134 mission, Chamitoff plans to conduct the first spacewalks of his career. "I'm very excited," Chamitoff said of the chance to float outside the space station. "That whole time I was up there prior, I was hoping for a chance to go outside and it never came up. We were ready for it the whole time." Chamitoff has a doctorate in aeronautics and astronautics. In his doctoral thesis, he developed a new approach for intelligent flight control of hypersonic vehicles. NASA chose Chamitoff as an astronaut candidate in 1998. In 2002, he served on the undersea NEEMO-3 Mission for nine days. He and his wife Chantal have two children.